Family is important. I'm sure that's something we can all agree on. Grandparents have a special place in our lives and it's one that no one else can compare to. Unfortunately, my grandparents have all passed on, but the time I had with them created ever lasting memories (as cheesy as that is!) 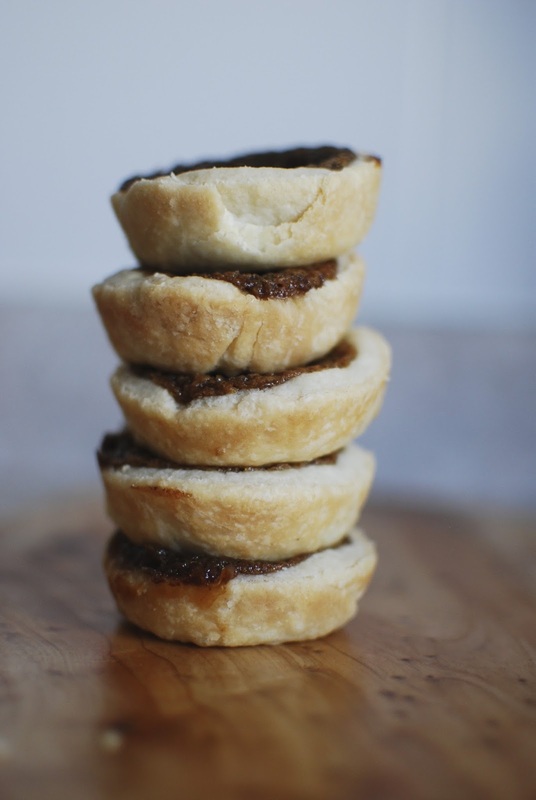 These butter tarts are a perfect example. My Nans' took substituting to the next level, but somehow most of what she made was always delicious. Perhaps it was my juvenile tastebuds, but I'd like to think that now, with a more refined palette, I'd still savour everything she fed us because it was from my grandma, y'know? And my Grampy was the pastry master. He made the best pastry, and consequently the best apple pie, always served with a slice of cheddar cheese. These are things that you'll never have the chance to have from them again, but you sure can try to recreate it. So here they are - butter tarts. Grampy's pastry and Nans' filling combined together to form the sugary, sticky goodness that defines a butter tart. Nans' recipe has no measurements, it's just "a blob of butter" or "milk". No measurements leaves room for improvisation. So as I made the dough last Sunday morning I thought a lot about Grampy, and as I rolled out the dough I thought about my best friend, Holly, and her grandma, who rolled many things with her rolling pin that I now call mine, and as I mixed together the "vanilla" and "flour" I thought of my Nans. Hug your grandparents (and your parents and your siblings and your friends) while you can because life is short. But sometimes the family recipes give you a little taste of what you're missing - figuratively and literally.